The FM-1318 FTTX Power Meter is a hand-held, compact, lightweight, and easy-to-use battery powered optical power meter. Together with any of the Wilcom Fiber Sources, this team makes a perfect combination for accurately testing multimode and singlemode optical fiber systems. 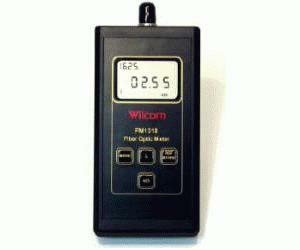 Model FM-1318 offers measurements in dBm, dBr, and microwatts. The optical input port on the FM1318 accepts any Wilcom thread-on style adapter caps. Adapter caps are required for operation and must be ordered separately. The FM-1318 measures optical power from + 5 dBm to -70 dBm with calibrated wavelengths of 850nm, 1300nm, 1310nm, 1490nm, 1550nm, and 1625nm allowing this unit to test passive optical networks (PONs) at the three main wavelengths recommended by the ITU-T (G.983.3) for use in fiber-to-the-home (FTTH), and fiber-to-the-premise (FTTP) networks. The FM-1318 is also ideal for general singlemode and multimode fiber optic testing.